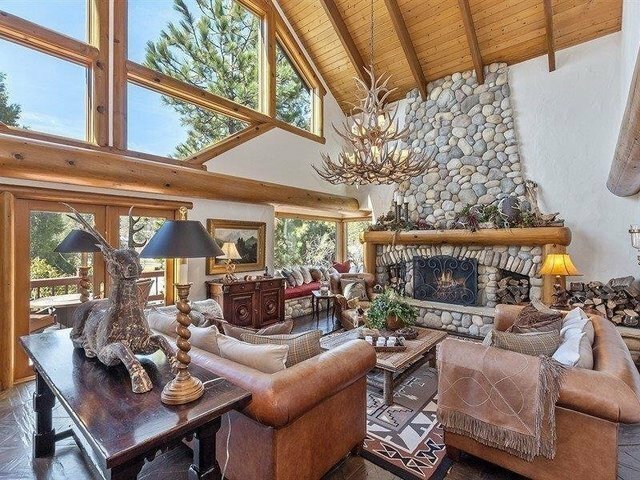 Elegant lodge style home, located on the 1st fairway with panoramic views of Lake Arrowhead Country Club golf course. This estate style home was professionally decorated and fully furnished. Included is an equity membership to the golf course,golf cart, and tennis and pool privileges. Some of the amenities include custom kitchen cabinetry, professional range, 2 dishwashers, 5 fireplaces, steam shower, separate wing with master bedroom suite with a private deck, skylights, high beam ceilings, pool table room, state of the art bar, gym, office, kids playroom and outdoor spa. The exterior is landscaped and has fruit trees. There are 3 decks located on each level. This is truly a one of a kind show place with all the mountain ambiance that a discriminating buyer for a mountain retreat would expect!